Basic house wiring can involve several types of electrical circuits and wiring configurations. A few types of circuits you might normally find in a home are described below along with reasons why they might trip. Amperage of the breakers may vary. For special appliance circuits you will need to know the required amperage of the device. Not sure if this is your problem? See the aricles 'Household Electrical Repair' and 'Residential Electrical Wiring' for more information and a listing of electrical topics. Outlet circuits - Local codes and requirements will vary, but you will usually have between around six outlets on a single circuit. This number could be lower for circuits that are planned for appliances that use a lot of power. Kitchens, garages and workshops might be examples. These types of electrical circuits will include a 15 or 20 amp single pole breaker. If this type of breaker trips, it is usually due to an overload. Too many devices are running at the same time. This will be especially true if you are running high wattage items, like heaters or fans. Try unplugging one item and reset the breaker. If it holds, try moving the item to an outlet on another circuit. Lighting Circuits - Many homes are wired with the lights on separate circuits. You may have ten to fifteen lights wired to a single circuit. These circuits will usually be on a 15 amp single pole breaker. Lighting circuits are not prone to being overloaded unless you have fixtures with auxiliray plugs in them. If you have a lighting circuit that continues to trip you will have to see if you have a short or a 'malfunctioning breaker'. Room Circuits - Another method of laying out circuits would be to have an entire room on one circuit or two small rooms. This method can simplify the identification of breakers in the panel. The breaker type would likely be a 15 or 20 amp single pole. 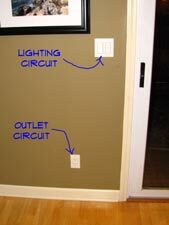 Similar to outlet circuits, a room circuit breaker will likely trim when it is overloaded. Try shutting off one item at time and reseting the breaker to see what is causeing the problem. Special Circuits - Certain appliances like a furnace or a refrigerator may be given dedicated circuits. The wiring would be for only the one device and the breaker would be sized per the requirements of the appliance. Dedicated circuits may also be installed for computer equipment. 240 Volt Circuits - Heavy duty appliances such as ranges, hot water tanks, air conditioners and dryers will require 240 volt dedicated circuits. These types of electrical circuits will have double pole breakers sized for the requirements of the device. GFCI Circuits - Ground fault interrupters are a safety feature for outlets that are near any wet conditions. A special circuit with a GFCI protected breaker may be set up to cover the bathrooms, kitchens and outside receptacles. GFCI receptacles can also be used and may affect other outlets within the circuit they are installed in. GFCI circuits will be 15 or 20 amp single pole circuits. This type of breaker is designed to prevent shocks from wet environments that can cause a device to ground out through a person. If any of the wiring gets wet it will trip the breaker. Remove the item that has gotten wet and do not plug it back in until it is thoroughly dry. AFCI Circuits - Newer homes are equipped with arc fault circuit interupter breakers. These are designed to improve safety by preventing fires. They are more expensive and are wired differently that normal breakers. These are required in homes built since 2008 for many circuits in a home. These breakers have a test button, a neutral terminal and an extra wire that goes to the neutral bar. You will need to check with your local building department for arc fault requirements in your area. Arc fault breakers can sense an 'arcing' occurance. A short in a wire will definately trim them. However, they are very sensitive and can at times be tripped by something as simple as plugging in a device. Try reseting the breaker after the item is plugged in. The breaker should hold, it is the arcing that trips it. Do you have an electrical project you are working on? Some related articles are 'electrical repair', 'fixing outlet problems', 'wiring light fixtures', 'troubleshooting ceiling fans', 'wiring switches' and 'wiring three way switches'. Follow the links for more information. This article gives you a brief overview of the different types of breakers in your home. We have also included what will cause them to trip. This will help you when you try and figure our why you are losing power. The above is not a comprehensive listing of all the possible types of electrical circuits and combinations of electrical device. It does give you an idea of what you are likely to encounter.